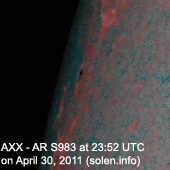 Last major update issued on May 1, 2011 at 05:25 UTC. 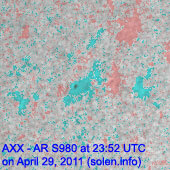 The geomagnetic field was unsettled to minor storm on April 30. 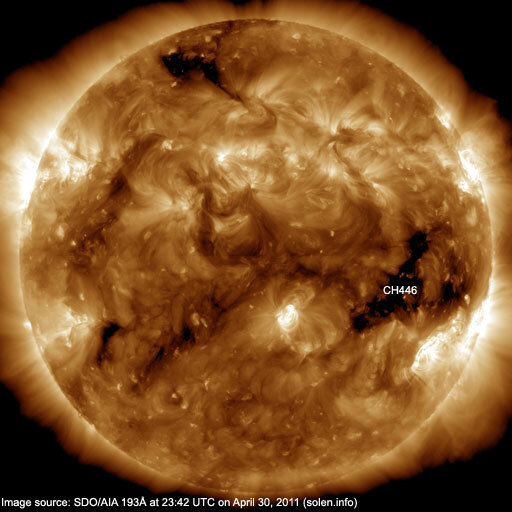 Solar wind speed ranged between 477 and 770 km/s under the influence of a high speed stream from CH446. 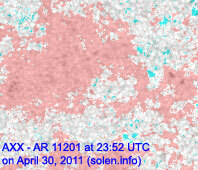 Solar flux measured at 20h UTC on 2.8 GHz was 109.5 (decreasing 4.5 over the last solar rotation). 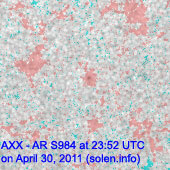 The planetary A index was 24 (STAR Ap - based on the mean of three hour interval ap indices: 24.1). 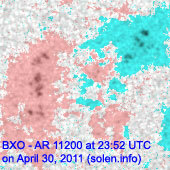 Three hour interval K indices: 43354344 (planetary), 43444333 (Boulder). 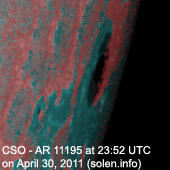 Region 11195 decayed slowly and will be rotating over the southwest limb today. 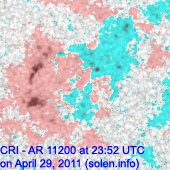 Flares: C3.2 at 11:51, C1.0 at 12:28, long duration C3.2 peaking at 13:26 UTC. 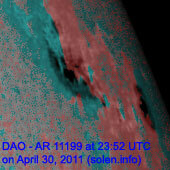 Region 11196 decayed further and has only a tiny spot left. 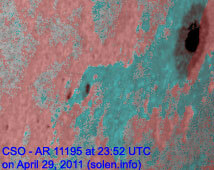 Region 11199 developed further in the trailing spot section. 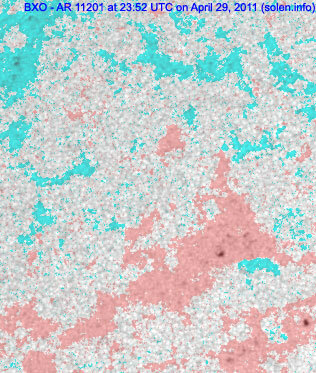 Magnetic complexity increased as a magnetic delta structure formed in the largest trailing penumbra. 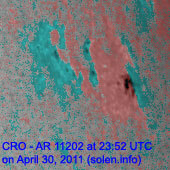 Flares: C1.5 at 08:19 and C1.7 at 09:04 UTC. 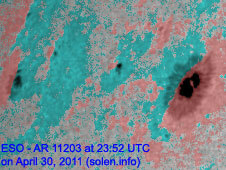 Region 11200 displayed no significant changes and was quiet. 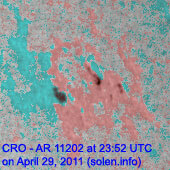 Region 11201 decayed slowly and was quiet. 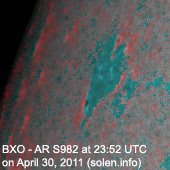 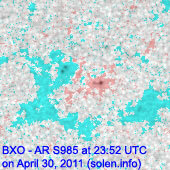 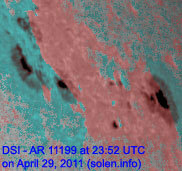 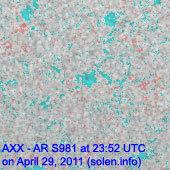 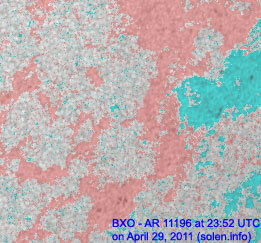 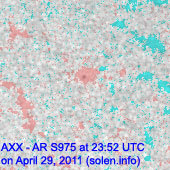 The northernmost spot observed the previous day was split off into S985. 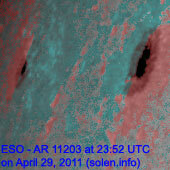 Region 11202 was quiet and stable. 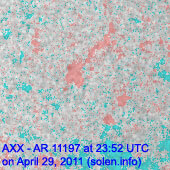 Region 11203 added a few spots and was quiet. 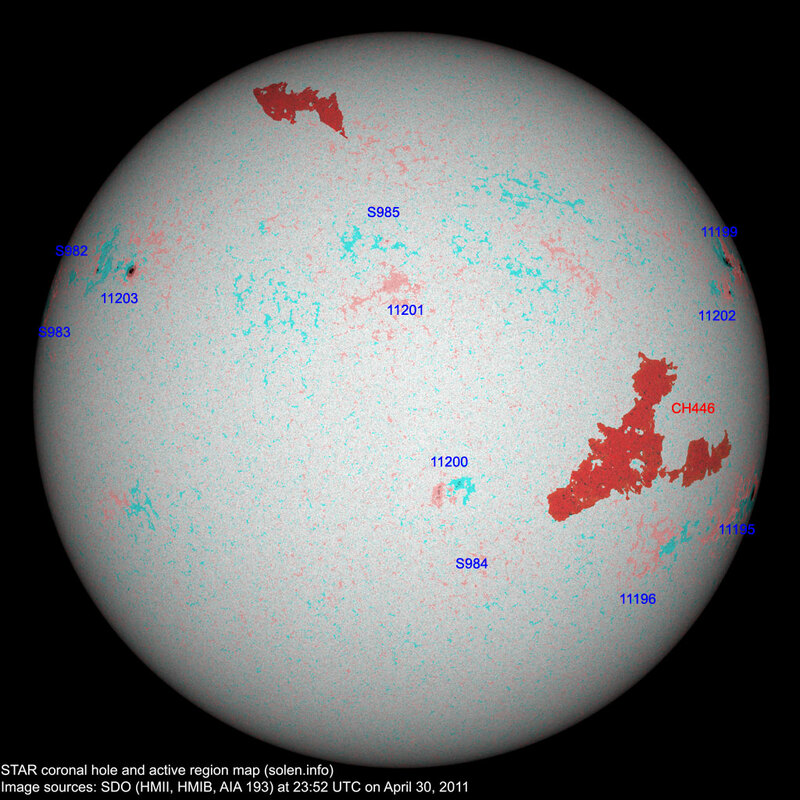 The geomagnetic field is expected to be quiet to active on May 1 and quiet to unsettled on May 2 due to effects from CH446. 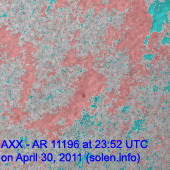 Quiet conditions are likely on May 3-4.